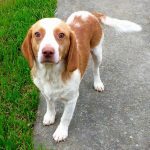 Harold is a sweet and happy little Beagle boy, now 3 1/2, who was owner surrendered in Kentucky. Before coming to New York, Harold was in a busy foster home with other dogs, children, and cats and enjoyed his time with his temporary family, but his new foster parents who adore him have a much quieter household and Harold is thriving! He shares his space with four other small dogs, has a huge fenced in yard, and gets attention all day long from his humans. His most favorite activity besides romping with Emma (see video) is to curl up next to foster mom and watch a good movie. Harold loves to let everyone know he’s a Beagle by letting his voice be heard from time to time (not a good choice for an apartment!) His foster mom has requested that Harold go to a home that has another playful gentle dog and a fenced yard so he can enjoy romping without restraint in a safe space. Harold is not a dog who could be allowed off leash – his Beagle nose would quickly take him off on a journey that could cause him harm. Harold is crate trained and sleeps in his crate at night. He is housebroken and will do great in a home where he is not left alone for long periods of time. Harold is neutered, fully vaccinated, and heartworm negative. If you are interested in applying for Harold, please contact the Pet the Pet Program at reverence@fltg.net. His adoption fee is $250 and applicants should reside within a 50 mile radius of Ithaca, NY or in the Rochester area so that a home visit can be conducted as part of the adoption process. Beagle, good with dogs, male, neutered, small, young. Bookmark.